Omar Almokhtar's Daughter: CAN ACACUS BE ONE OF THE world seven wonders.......WHY NOT....??!! CAN ACACUS BE ONE OF THE world seven wonders.......WHY NOT....??!! 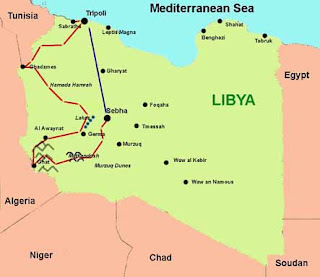 ........don't you know acacus ....alo t of libyans answeed me yes.what's it??????? what a real shame....acacus is a wonderful place in libya that we should all be proud of....really i started thinking of it yesterday while i was trying to vote for the world 7 wonders of nature...i saw places from every where...but none from libya....really from the first time i thought why not ACACUS.....??? 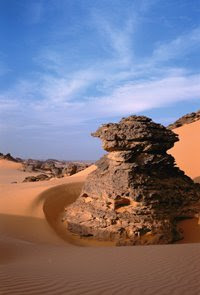 Tadrart Acacus (Arabic: تدرارت أكاكوس‎) is a desert area in western Libya and is part of the Sahara. 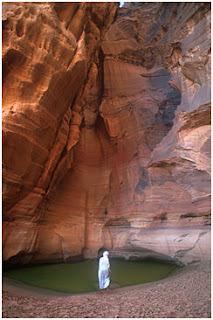 It is situated close to the city Ghat and not far from the Algerian border. Tadrart means 'mountain' in the native language of the area(Tamahaq language). It has a particularly rich array of prehistoric rock art. 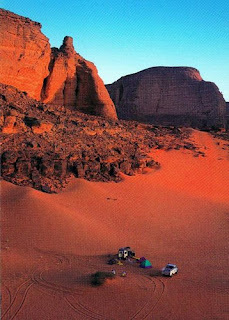 The Acacus has a large variation of landscapes, from differently coloured sanddunes to arches, gorges, rocks and mountains. Major landmarks are the arches of Afzejare and Tin Khlega. Although this area is one of the most arid of the Sahara, there is vegetation, such as the callotropis plant. 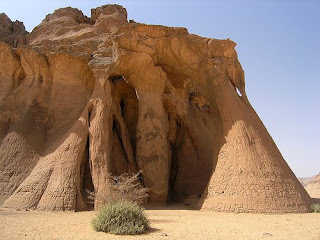 The area is known for its rock-art and was inscribed as a UNESCO World Heritage Site in 1985 because of the importance of these paintings and carvings. 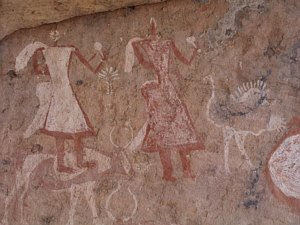 The paintings date from 12,000 BC to 100 AD and reflect cultural and natural changes in the area. There are paintings and carvings of animals such as giraffes, elephants, ostriches and camels, but also of men and horses. Men are depicted in various daily life situations, for example while making music and dancing. Great job ... realy Tadrart Acacus is wonderful place and it should be included the WORLD SEVEN WONDERS, I'm already vote to it,and will vote to you to become the Patriotic Girl. I will definitly nominate it. 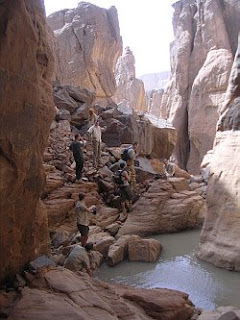 many people in Europe go on organised holidays to the Akakus mountains, they are becoming quite well known. i know about it but honestly not all these information..so thank you for educating us. and i will definitely nominate it. Hello Weda: Friend should not be sad. On the right bank there is a translator of the language you want to blog. If you are unable to send you this page that is tamnbién translator, but you must put you the link. Animo and we can understand. Beautiful images of a unique place, thank you for sharing it! It is a great happiness and a surprise to me, just to receive for the first time a visitor from Libya. TNX for the comments on my blog. You have indeed wonderful photos taken in Acacus. I loved them all. It was certainly interesting for me to read that post. Thanx for it. I like such themes and everything that is connected to this matter. I would like to read a bit more on that blog soon. It was certainly interesting for me to read this article. Thanx for it. I like such themes and anything that is connected to them. I definitely want to read more soon. hi there ppl. I'm actually into shoes and I had been looking for that singular brand. The prices due to the fact that the sneakers are approximately 330 dollars on every site. But for all I bring about this location selling them for the benefit of half price. I absolutely want these [url=http://www.shoesempire.com]gucci sneakers[/url]. I will absolutely order those. what can you say about it? good morning dudes. I'm actually into shoes and I was digging for that meticulous make. The prices due to the fact that the shoes were around 350 dollars on every site. But for all I bring about this location selling them someone is concerned half price. I really want those [url=http://www.shoesempire.com]gucci sneakers[/url]. I will absolutely purchase those. what can you tell me about these? good day ppl. I'm actually into shoes and I had been looking for that particular model. The prices seeking the velcros were all over 220 pounds everwhere. But for all I found this locate selling them for the benefit of half price. I absolutely love these [url=http://www.shoesempire.com]gucci sneakers[/url]. I will absolutely order these. what do you think? What's up with Mizda& Sabha.....????~!!!! !